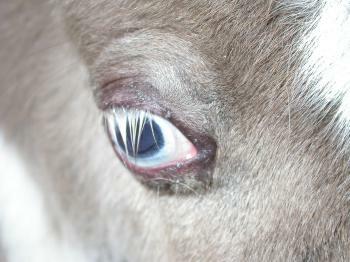 This week old mianture horse foal has been having quite considerable ocular irritation. What is the problem and what might you suggest to the owners? 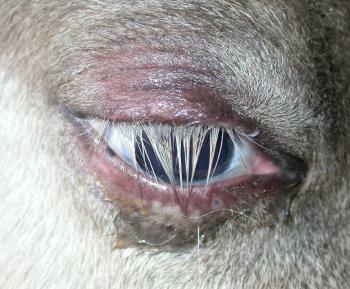 The cause of the irritationis likely to be trichiasis with these amazingly long eyelashes abrading the cornea. We thought of tacking the eyelid as with a congenital entropion or even performing a Stades procedure, but the easiest thing is to get the owners to roll back the lids even few hours so that the lashes do not abrade the ocular surface. In a few weeks the rather bulbous appearance of the eye will reduce and the irritation from the lashes will reduce. This entry was posted in Cases and tagged Horse, trichiasis. Bookmark the permalink.